Just to complete the Fritillaria camschatensis series, here is one of the yellow forms. We have at least three different clones and this is the best with good sized yellow flowers - look carefully and you will see that it has no style, so I will not be getting any seed from this plant. 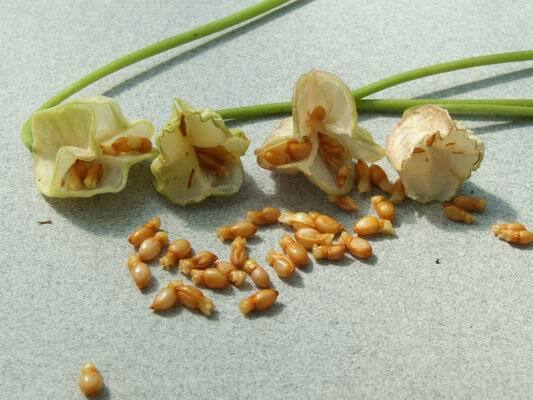 I have never had viable seed set on any of our yellow forms of Fritillaria camschatensis but they do increase well by small stolons which, when removed and grown on separately from the parent bulb, will reach flowering size in about three years. The first of the Nomocharis are in flower now and, as ever, I do not attach a species name to them as they are all hybrids of garden origin. 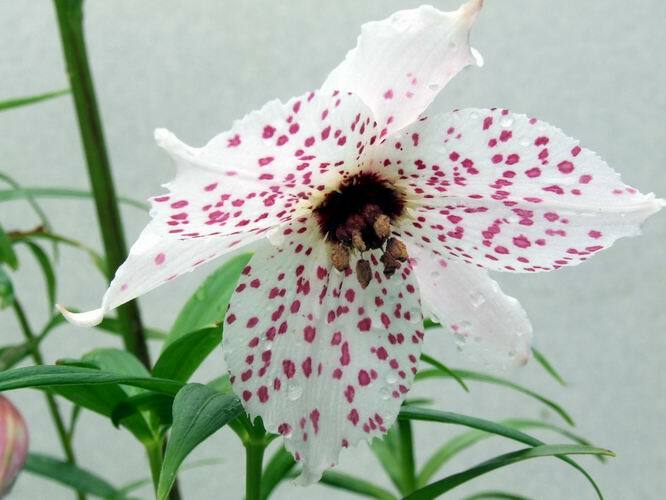 Like the Fritillaria above this flower has no style so will not set any seed, the pollen however can be used to fertilise a flower that is complete with its style. The flowers are all of the same basic formula - pale pink petals with blackcurrant spotting; an irresistible combination. Always collect the seed from these and sow some every year as they can succumb to virus. Ian Christie showed a lovely selection of them on a recent forum post. 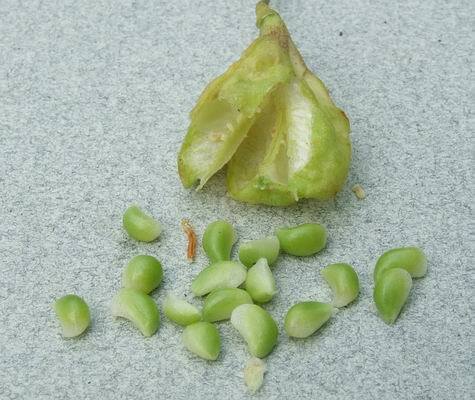 It is also good to see pictures of seeds appearing in the forum. I have always been interested in photographing all parts of the plants and not just the flower; in fact I often think the flower is the least interesting part of the plant while the seeds and bulbs are fascinating. Nice velvety red Crocus pulchellus seeds well illustrate this point. While collecting your seeds watch out for the fauna. 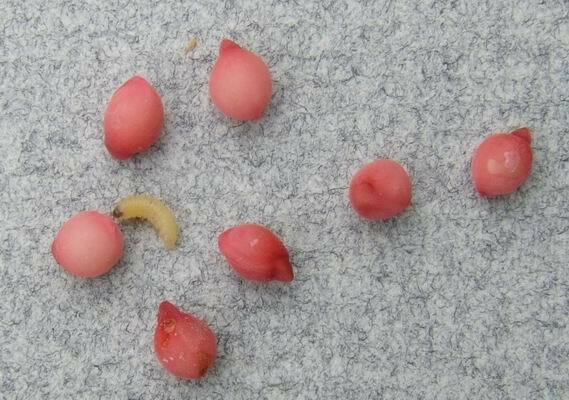 Here I found a maggot inside the seed capsule, eating away my seeds. 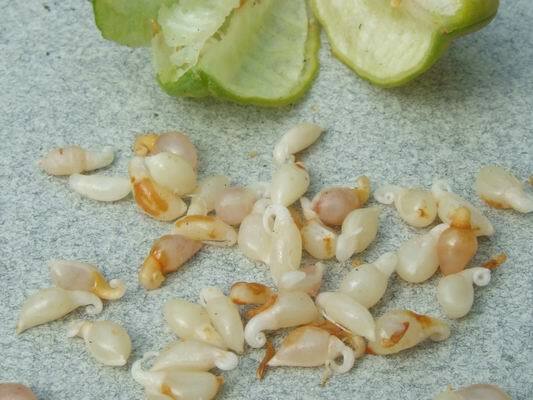 I am not sure if it was placed inside the ovary as an egg before it opened or if it got in as the capsule dehisced; either way it is best not to let them eat your seeds. I discussed the link between the Eurasian erythroniums and the Eastern North American ones in a previous log and now I will continue the story by looking at the seeds. Notice how the seeds of Erythronium japonicum have a very distinct fleshy feature where they were attached to the ovary. Known as an elaiosome or caruncle, this fleshy attachment attracts ants which will distribute the seeds in return for the sweet reward. A similar feature is seen on these Erythronium dens canis seeds, where the attachment is curled. The elaiosome is less obvious in these Erythronium americanum seeds but it is still just present, showing that there is an ancient relationship between these groups. It is often said that an area that displays the biggest diversity of a species was most likely to be the ancestral homeland of that genus - this would suggest Western North America as the evolutionary homeland for Erythronium. I do not accept this theory and much of the new science also disproves this. It is much more likely that these areas where there is a wide diversity of species also have a wide diversity of habitats, giving rise to local races evolving as they adapt to a specific environment. Just to allow you to compare directly, here are the seeds of Erythronium japonicum, dens canis and americanum. 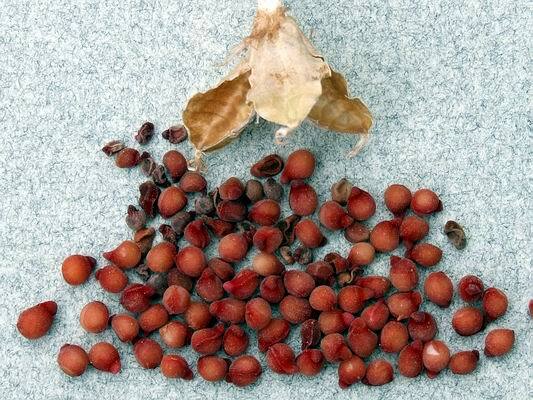 The americanum seeds will turn white then brown as they mature but I opened the capsule to get this comparative picture - the seeds will germinate fine as they are fully mature, they only go brown when the capsule withers and they start to lose moisture. A new plant for us is this purple flowered Corydalis sp. It is most likely related to the group that contains C. flexuosa and elata as they have a similar growth form. It also looks like it will be most obliging as it is already setting seed without any intervention from me. Here, yet again, is my cross between C. elata and flexuosa, Corydalis x 'Craigton Blue'. I only remember getting a good seed set in one single year and all the resulting seedlings come from then. By the time I had realised it was setting seed much of it had already been scattered in the gravel paths. We had a good germination the following year and every year since then we get a few new seedlings appearing. I am convinced that this is seed from that original year that has germinated sporadically over the years. Despite looking closely every year I have never seen any more ripe seed capsules. Corydalis have very interesting flowers and it is worth pulling one apart to see how it works. 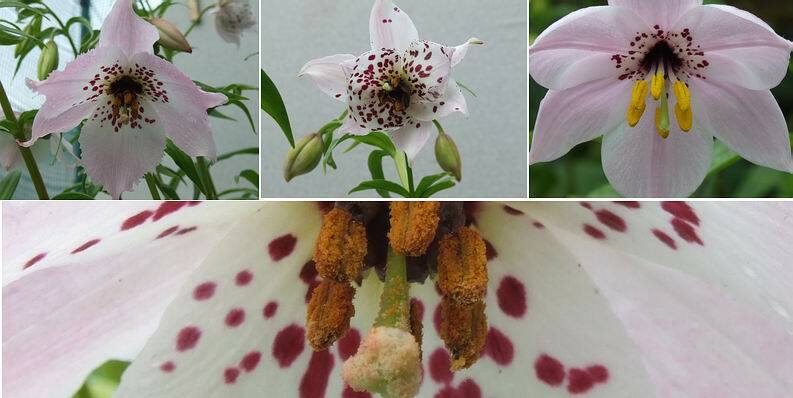 The bits I am fascinated by are the two black growths contained in the white pouch beside the anthers and stigma. What purpose does it play? Is it to attract a pollinator? 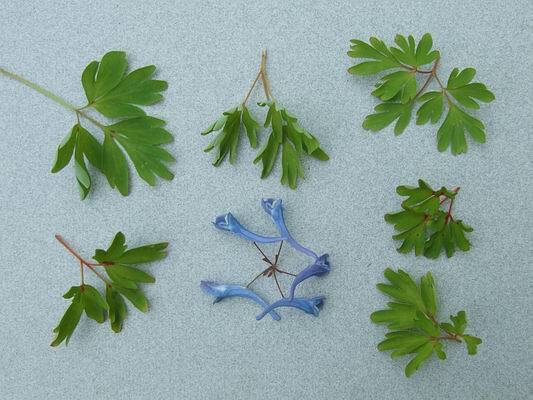 As I have said, Corydalis x 'Craigton Blue' is not a single clone but a whole bunch of very similar plants that are very difficult to separate by flower colour; the most obvious difference between them, and it is still only a very slight variation, is the leaf shapes as seen in this small selection. 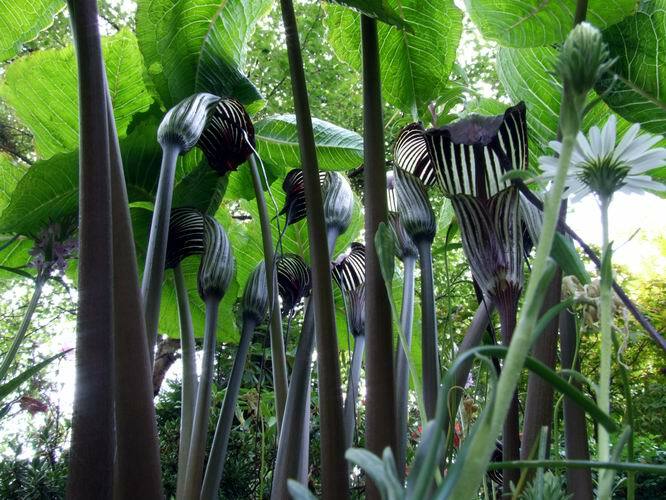 I am still waiting for the new edition of the Arisaema book to be published so I have not got names for all our Arisaema sps. but I went for a new angle when photographing this dramatic clump.